It's kind of ironic actually. I'm not a fan of chubby babies, yet all of my babies have been chubby and freakishly tall compared to their same-aged baby peers. Don't get me wrong, I think they are cute & I have nothing against the rolls upon rolls of baby fat. However, I don't prefer chubby. If I had my pick, I'd prefer that mine were all runts. Many of my friends have babies that are several months older than Landon (age 6 mo. 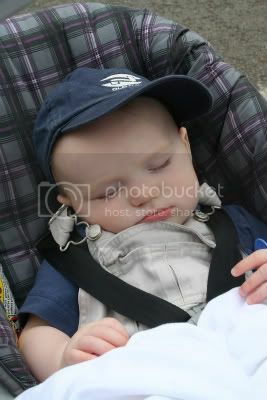 ), yet they seem to retain their newborn baby look for longer. I admit it. I'm jealous. I love the newborn stage, and because my kids grow so darn fast, I feel like they are out of that stage before I'm ready. I guess it's ok...at least I can pinch Landon's cheeks while he's too young to tell me to stop. He'll have the rest of his life to be thin. Here's introducing our little (ok, not-so-little) Chubby Cheekers.